Around 14 years ago I was very riled up when the husband-man got me a bunch of roses on Valentine's Day. That very morning I had noticed that the nearest gas station was selling roses at double the usual price and I had wondered, "who are these fools who pay double the money to buy flowers on V Day". By evening I knew who they were. The husband-man has never got me flowers since. At least not on Valentine Day. I am more than happy. However what with the kids and their celebrations at school, my outlook towards this day has mellowed to the point that now I accept this day as a big pink heart with a lollipop stuck to it. I actually look forward to getting the pink and red goody bags ready for the first grader who comes back with a candy loot after the V day party. Well some people have to do their business I guess. 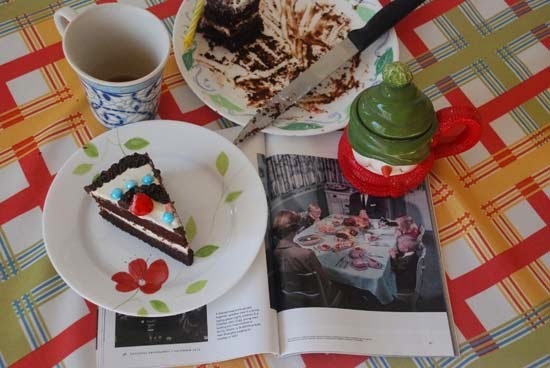 Today I will share with you a Chocolate Cake which has a very close tie to Valentine's Day. This recipe was given to me a couple of years ago by my then seven year old niece, my friend R's daughter. She had made this cake with her mother and it was totally delicious. When I asked for the recipe, she had rattled off the exact recipe from memory and then told me that if I googled for "Hershey's Perfect Chocolate Cake", I would find it on internet. These kids are too smart I tell you. Soon enough Big Sis too was hooked on to the cake. 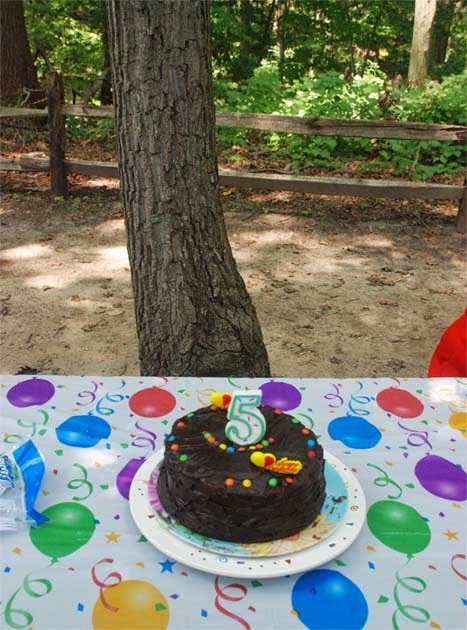 For LS's fifth birthday, both my niece R and Big Sis baked the cake. Usually they bake the cake as instructed in two 9" circles to make a two layer cake but since then they have made 3 layer cakes, a single layer large cake and even cup cakes with the same recipe. Big Sis has made it for my anniversary, for her sister's birthday and even for her own 11th birthday. 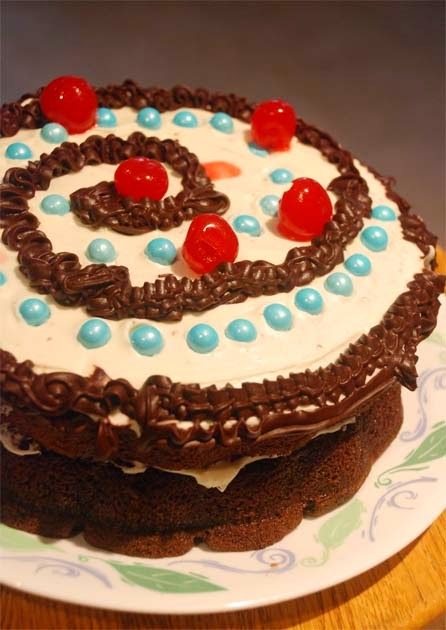 That smart 7 year old who shared this recipe with us turns nine on Valentine's Day this year. May she grow up to be as sweet and smart as she has always been and may her life be rich, moist and perfect like this cake. The recipe is really simple and easy to follow with always delicious results. The cake is rich, moist and very chocolate-y. For most parts kids aged 7 and older can make this with some adult supervision. It does involve boiling water and using it, so that is the step when I would expect an adult to come in and grab the apron. 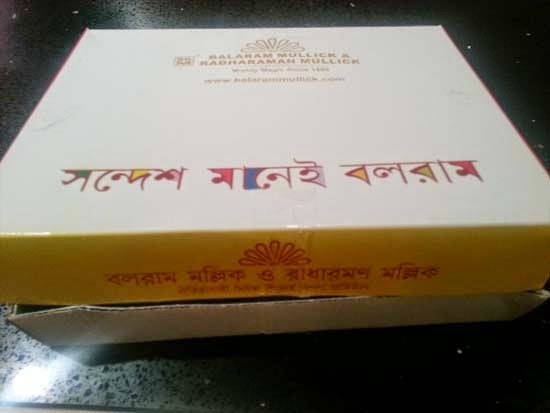 Though the title of this post is about "Eating in and around Kolkata", unlike the last one, this one is not about food at restaurants. It is more about the simple things, which were so much a part of life once but has now become blog worthy by their mere absence. I don't think the adage "Distance makes the heart grow fonder" applies to any relation so aptly as to our relation to food. 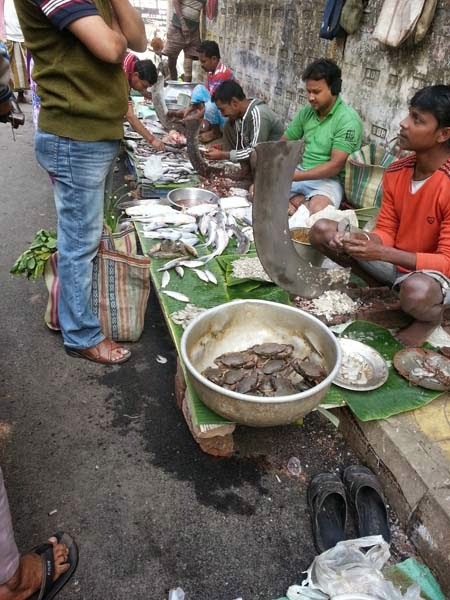 The one thing that was on my mind even while we booked our tickets to Kolkata was fish. I did not really want to gorge on Ilish or Golda Chingri. Instead my heart was set on "chara ponar jhol"(fresh baby rohu or katla cooked in a soupy gravy), "tyanga maacher jhaal" (tyangra fish in mustard gravy) and a very light gravy of winter vegetable like cauliflower, sweet peas, potatoes with fish and bori -- my Mother's speciality. My parents and the husband man's parents however thought otherwise. Since their priority now days is the granddaughters and I come a very far third or maybe fourth, all the fish dishes planned were around them. Any small fish with head and bones were out. Fish like Bhetki and Prawns were in. Since the husband-man is not a big fish lover either, he was happy with my Mother's awesome dish of Bhetki in a cashew gravy, Bhetki Kalia and fish fries. The daughters of course refused to touch any fish and settled on paneer. I threw a tantrum. "Bhetki is not why I have travelled for 24 hourrs in a closed steel compartment where the air smelled like a mix of biriyani, sambar, dolce vita and flatulence", I cried. The next morning I was out with my Baba to scour the neighborhood fish market. I didn't trust him. Left on his own, he would again concentrate on only those fish which he faintly hoped his granddaughters would love. 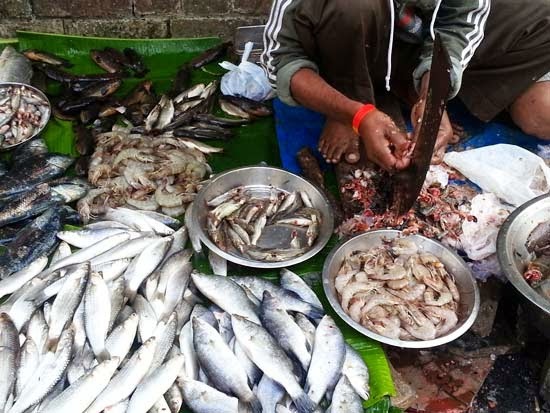 The very sight of "gleaming silver fish" in the neighborhood bajaar upped my spirits. I took out my phone and started clicking pictures. The fish sellers gave me an incredulous look. An elderly Bengali gentleman standing nearby asked if I was really taking pictures. Another lady asked why. When I said I don't get such good fish where I live, they looked at me with sympathy and asked where I lived. Then one of them said their nephew lives in Oklahoma and if it was near where I lived. Another said that no one cooks in USA and every one eats microwaveable food. The fish seller trying to pull the conversation towards himself said that he was much used to pose for cameras. Every year many of his clients who live in foreign lands ask him to pose with his fish for photos. And then all of them make calendars with these pictures and send him the calendars on New year. Why, even German people have photographed him and made calendars. "Dekhen giye, koto koto calendar amar baritey", he smirked. ("Go and see, how many calendars with my photo are lying around"). I smiled politely and bought Tyangra. He was apparently my Baba's favorite fish seller. The next few days, I gorged on "chara ponar jhol" and "tyangra maacher jhaal" cooked by Ma. She over did it and every meal overflowed with fish. Ma also made and an amazing "kaankrar jhaal", a crab curry, which unfortunately I did not have the patience to learn. 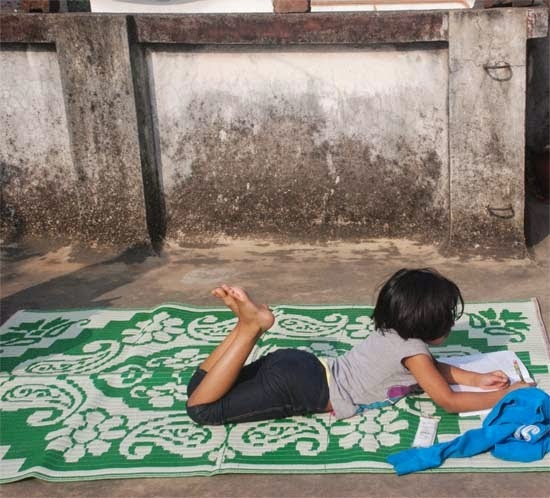 In a couple of days, we were off to visit the husband-man's parents who live in a town about 170km from Kolkata. My childhood is scattered over several such small towns and though my parents now live in the city, I re live my childhood days through the husband-man's hometown. The high point of the three hour bus journey is the JhaalMuri at Shaktigarh. 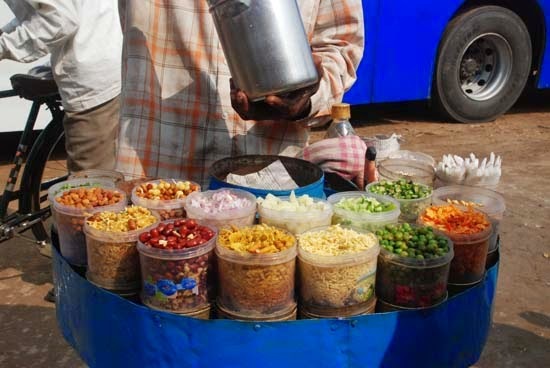 Though Shaktigarh is famous for its lynagchas( a sweet akin to gulab jamun but elongated in shape), the shops along the Highway do not really have the best lyangchas in town and after several disappointing lyangchas I have now learned to trust only the jhaalmuri man. Jhaalmuri, puffed rice with specks of onion, green chilli, bits of cucumber, fried peanuts, julienne of boiled potatoes and tossed in mustard oil, is a simple concoction which I love. When on the road and a few foods can be trusted, this really fast food seems to hit all the right spots. 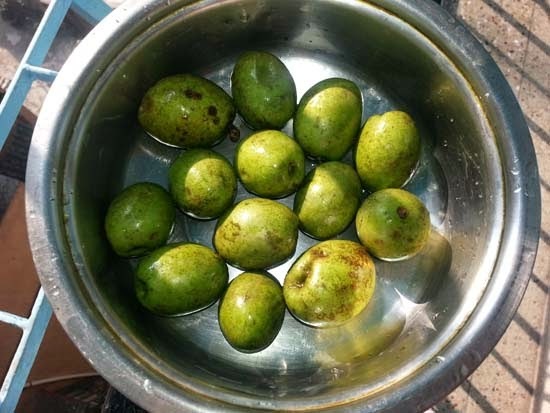 It is healthy, fresh, and if you ask the jhaalmuri man to skip the pickle oil of dubious origin or the onion which is not looking fresh cut, you have a perfectly wholesome snack in a minute. 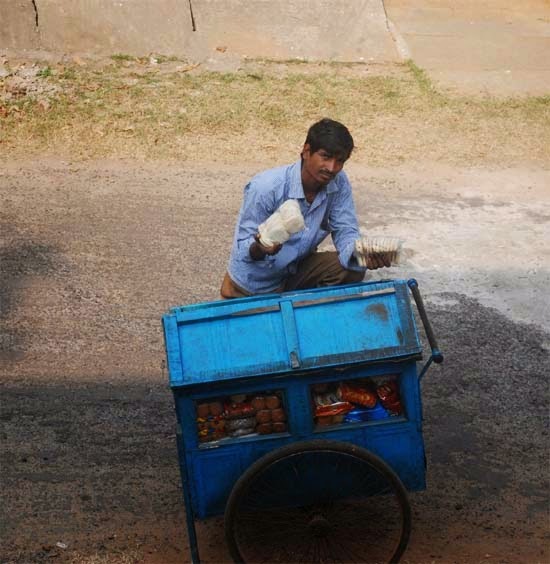 I watched with hawk eyes as the jhaalmuri wala tossed the muri in a steel dabba. Since I have been hearing of the "muri mashla" packaged and sold, I asked this guy what was the spice he added at the very end. He declared it to be a simple "dhone-jire-shukno lonka bhaja masla"(coriander seeds-cumin seeds- red chilli dry roasted and powdered). If that is the trade secret, no need to buy the packaged moshla stores sell. 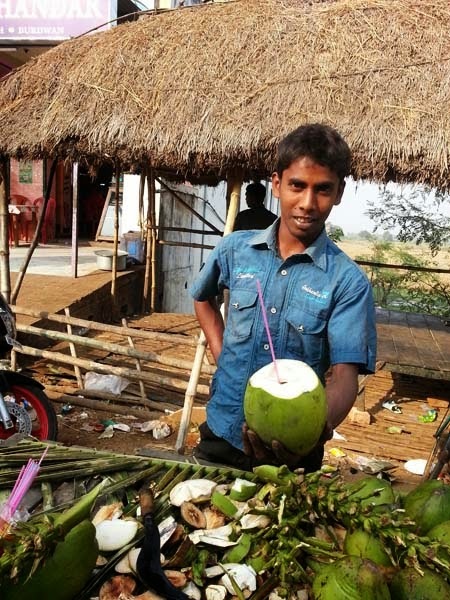 To offset the green chillis, we had "daaber jwol" or tender coconut water. When Big Sis was younger, she would call it "Dabba Juice". Surprisingly, bot the girls love the muri but do not appreciate the tender coconut water. 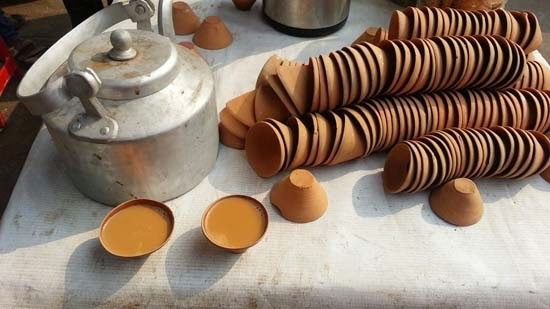 This was followed with "bharer cha" or cha in earthenware cups, the only way tea brewed along the highways is served. At my in-law's place the meals are around local ingredients which are easily available. One was the "Bok Phool Bhaja" which I ate after years. These are flowers of the "Humming Bird Tree". In Bengali, these flowers are called "Bok Phool" or "Crane flowers" because of their resemblance to white cranes. The flowers are dipped in a batter of besan and rice flour and fried crisp. There was also "mulo shaak bata", radish greens paste which was delicious. 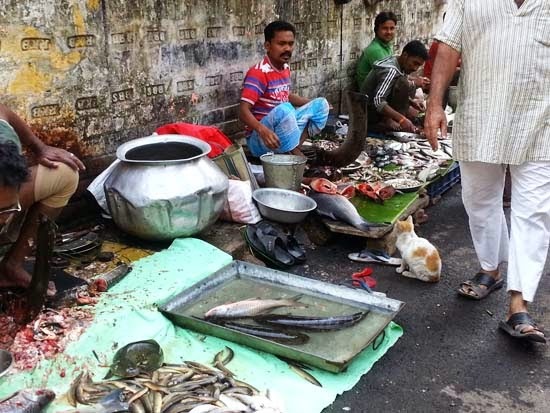 When it came to fish, they had again defaulted to all kinds of Bhetki Kalia and Bhaja. This Bhetki was getting on my nerves by now! But I like the little town with its sedentary life style so much that I drowned my Bhetki sorrow and compensated it with the little treasures around, like the "bread-biscuit wallah" who comes calling every morning around ten with his "chaand biscuit" and "madan katkati" and the "hannsher dim wallah" who sells duck eggs from his bicycle to the cries of "dim chai dim". My idea of a perfect life is lounging on a rocking chair in the warm winter sun in such a small town as life slowly crawls around me. 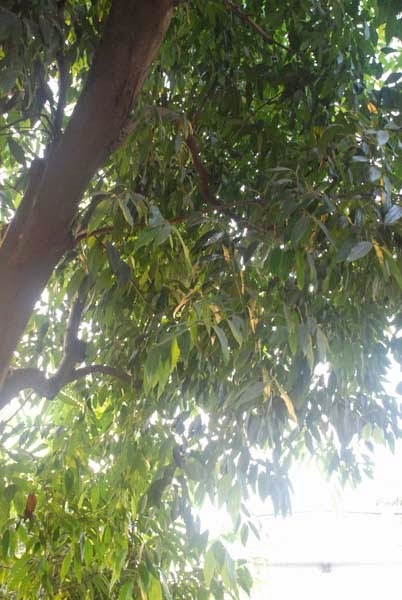 Life literally crawls there, even the sun moves slow casting its shadows this way and that, peering in through the huge "Tej Patta" tree and playing hide and seek with the areca palm which stands tall and erect. I know a lot of people go to retreats and meditation resorts to get away from their stressful city life but I think that stressful life is a choice you make. One takes that choice in return of the modern world luxury and material pleasures. But there are many who have chosen a slower paced life style for themselves, a life where you can live in the moment and not chalk your day by the minute. When I visit such small towns I often feel a tug in my heart for a life I could probably have had but thought too sedate and boring when the choices were doled out.. 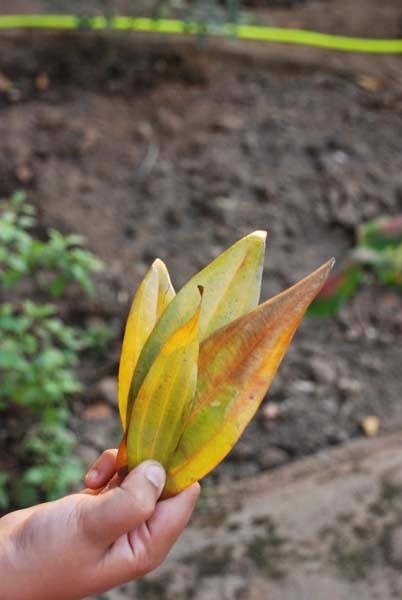 The husband-man's home is surrounded with a lot of trees and both Big Sis and Little Sis were very excited with "supuri" or areca nut but not really interested in tej pata. The star of the stay was "Kodbel Makha"! 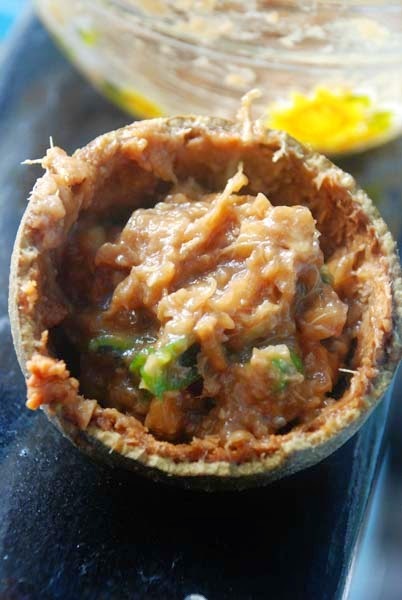 Kod Bel or wood apple has a hard exterior and the pulp is sour and tangy. 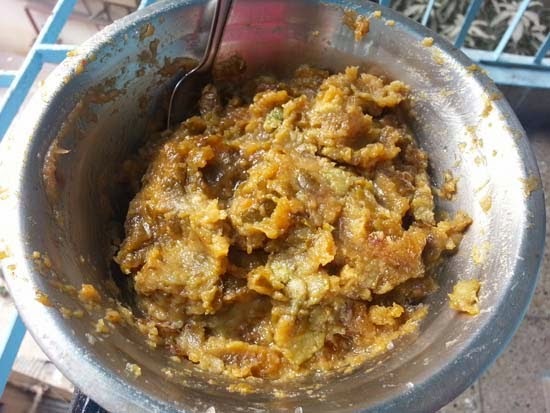 The pulp is scooped out and mashed with mustard oil, green chilli, salt and sugar. When we were younger we would scoop it, mix and eat it right there on quiet winter afternoons, sitting on the terrace, the sound of our slurping piercing the quiet.Ideally it tastes better if sunned for a few hours or a day to reach that perfect balance in flavor and taste. Back in Kolkata, I got my Phuchka fix at Dakhhinapan. The fact that I had it with a school friend whom I met after about 25 years and her daughter made it all the more memorable. I tried two kinds, the usual ones and one a tauk-jhaal-mishti which a lot of the younger generation around were asking for. I would suggest you to stick to the good old original one if you are not going to have it regularly. 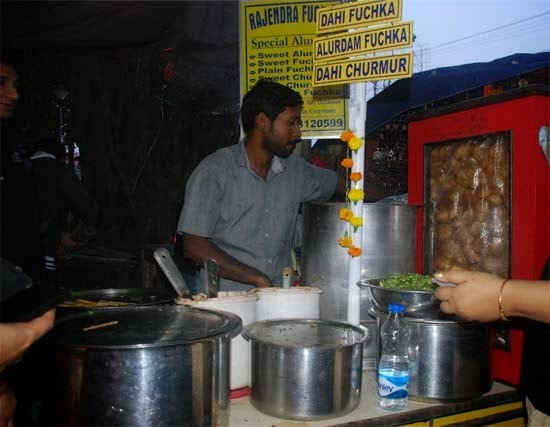 Apparently dahi Phuchka and Aloor Dum Phuchka at this stall is very popular but I didn't want to skitter away my few chances at eating Phuchka by deviating from the original. Two more places we went out to eat was "Hakka" at City Centre 1. It was a pre-birthday treat for Big Sis from her grandparents. Since she adores Indian Chinese and this restaurant seemed to be quite popular we decided to go there. Both the girls loved the food. The chili chicken was just right and they politely suggested that the one I make at home is not as good. I guess it is because of the absence of ajinomoto in my dishes. Chilli Potatoes and a Lamb dish were also very good. More Indian Chinese was had when I went out with a college friend, who again I met after many years. 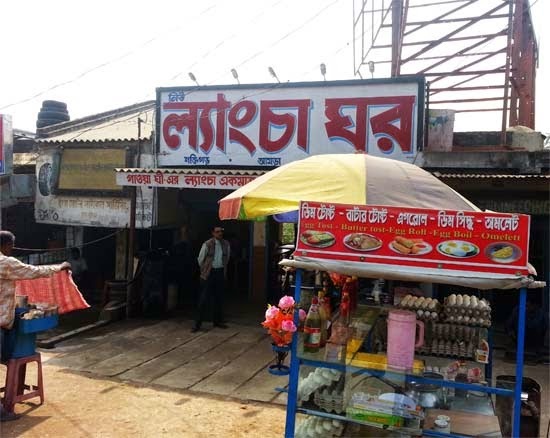 She treated me to a delicious lunch at the old favorite Bar-B-Q where we talked and ate and discussed about the very polite server who refused to budge from his English in spite of my severe Bengali requests. 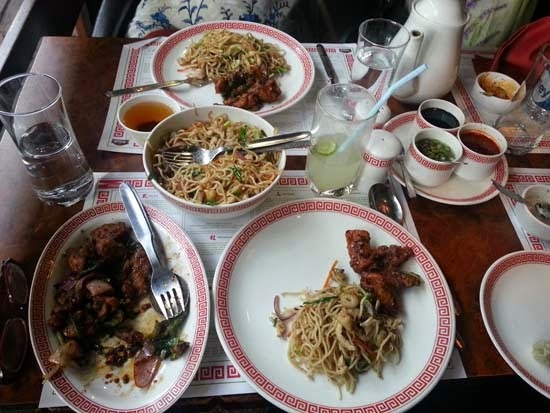 The Hakka noodles and the Chilli Chicken here were literally to die for. The days were so good that I really did not want to come back. All the food that I was eating had to be heavily balanced with daily doses of "Hajmola" to eat more stuff at home. Even then I couldn't resist the things that I do not get here. Like "Jolpai" or Indian Olive. My Mother makes an amazing and very simple fresh chutney with this. She cooks the olives in the pressure cooker with enough water for 1 whistle to make them soft. The water in which the olives are boiled is strained and the olives which are now soft but not totally mushy taken out and cooled. 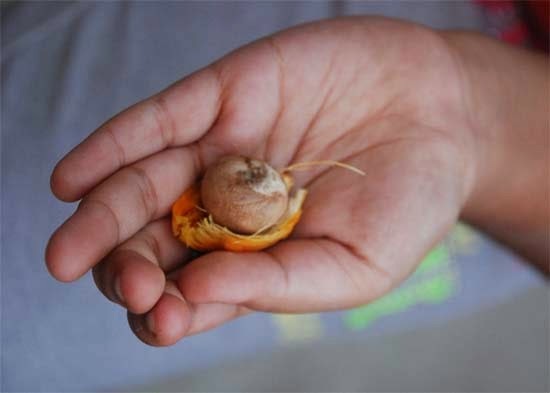 Then with her hand she presses them to separate the seed from the soft flesh. 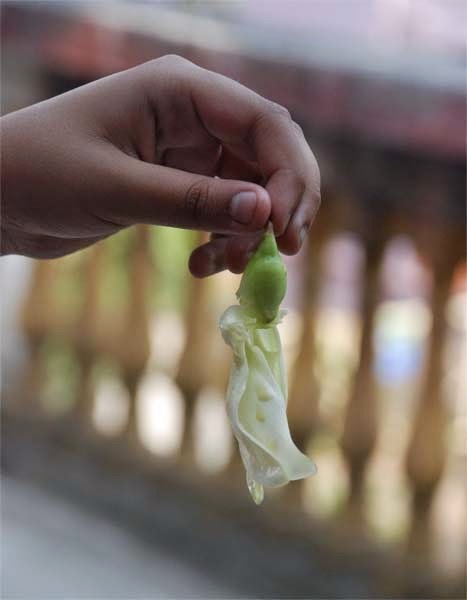 Once she has removed all the seeds, she adds mustard oil, finely chopped green chili, little sugar and salt to the jolpai and mashes it all up with her fingers. This mix when kept out in the winter sun for a couple of days tastes like heaven. This chaatni needs to be eaten within a day or two. For a longer shelf like, my Mother suggests to cook them in mustard oil tempered with Paanchphoron. And then it was time to pack bags and get back with only a box of this to remind us of that when you choose to make a home in two countries you learn to appreciate the sweet treasures that each one offers.